The author is a corn agronomist with the University of Wisconsin extension. 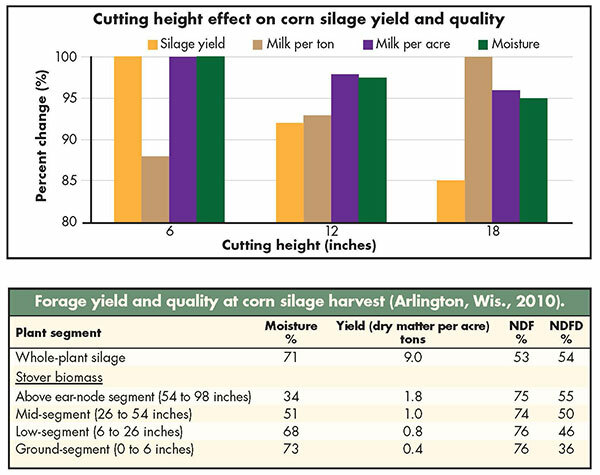 Corn silage harvest presents a relatively narrow window to optimize feed quality. Pull the trigger too early and you have a wet mess that is sour and seeps. Pull it too late and molds can develop and digestibility is lower. Either way, corn silage yields are reduced and cows do not perform as well. So, you watch your neighbors and try to decide when to start harvesting. Or, horror of horrors, the custom chopper shows up at your farm gate ready to chop. Your dilemma, “Do I chop, or do I tell him to come back later?” Then that brings up the question . . . if he leaves, will he come back in a timely manner? There are a number of tools that can be used together to predict optimum harvest date. These include noting hybrid maturity in combination with the planting date, recording the tasseling date and adding 42 to 47 days and determining moisture by drying down a representative plant sample with a microwave or oven once the kernel milkline has started to move. Decisions made before harvest, such as hybrid selection, planting date, plant population and soil fertility, and those made after, like packing, sealing and feed-out rate can influence corn silage quality. At some point, yield is no longer the objective and moisture levels drive the harvesting decision. Each structure has different optimum moisture ranges for ensiling. The optimum moisture for a bunker silo is 65 to 70 percent, a bag silo is 60 to 70 percent, a concrete stave silo is 60 to 65 percent, and for an oxygen-limiting silo it is 50 to 60 percent. To ensure good silage preservation, harvest at the correct maturity and moisture, pack to densities greater than 17 pounds per square foot, seal the silo tightly so that no oxygen can enter, and feed-out at a rate that minimizes spoilage. Shrink losses in the silo can never be totally eliminated and occur due to fermentation loss (2 to 5 percent), leaching loss (1 to 3 percent) and feed-out loss (5 to 11 percent). If forage inventories dictate that maximum yield is not needed, raising the cutter bar can change the moisture and quality of the corn silage being harvested off the field. Raising the cutter bar from 6 to 18 inches can reduce yield up to 15 percent (see figure). However, milk per ton improves because NDF (neutral detergent fiber) digestibility is greater in higher plant segments (see table). Only small changes in NDF are measured in vertical plant segments. Even though forage yield is reduced, milk per ton improves up to 12 percent; so milk per acre only falls 3 to 4 percent. At corn silage harvest the driest plant part is the grain, while the wettest plant parts are the stover (leaves, stalk, shank and husks), especially the lower stalk (see table). Whole-plant moisture falls 3 to 4 percent as the cutter bar is raised from 6 to 18 inches (see figure). There are a number of ways that raising the cutter bar can be employed to change corn silage quality. If cut forage at normal height (6 inches) is too wet, then raising the cutter bar will result in drier forage. This can be useful in situations where the custom chopper has shown up early. It might also be useful when harvesting parts of a field that are replanted or at a lower elevation than the rest of the field. Adjusting the cutter bar can be used as a method to “even up” a field due to soil characteristics or in years of drought or flooding. Leaving the worst part of the plant, the lower stalk, in the field can help with snow capture and reduce soil erosion. To make correct cutter bar height decisions, having a forage moisture meter in the discharge stream of the chopper would be a good tool to provide confidence to the operator for the adjustments made. This article appeared in the August/September issue of Hay & Forage Grower on page 16.